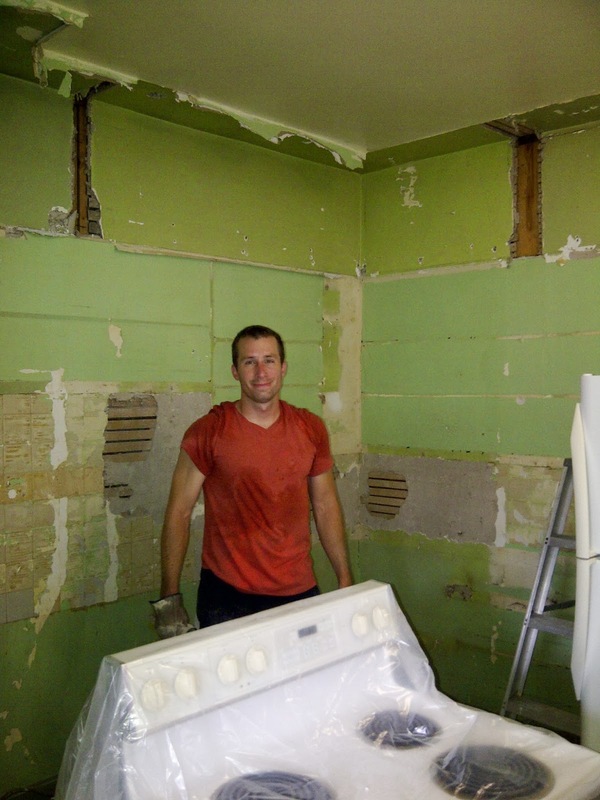 Now that all the wallpaper is off, it’s demolition time in the kitchen. Those gray plastic stick-on tiles in the kitchen… they have got to go! I used a small crowbar, and a flathead screwdriver to pop these right off. Please make sure to wear safety glasses if you are doing anything similar to this because sharp plastic pieces tend to break off. Now what to do with that soffit??? To keep it or take it out? After designing and redesigning the kitchen cabinet layout multiple times, the final decision came down to remove the soffit. With the 9 foot ceilings, the soffit made the ceiling look lower. I wanted to emphasize the ceiling height and actually make the room look larger than what it is. So I called in my hefty defty (other) big brother who has a secret passion for demolishing things. (I mean who doesn’t, Right?...It’s like on the movie Office Space when the guy takes a baseball bat to the printer.) :) Anyways….. After 3 hours and only using a sledge hammer, the soffit is gone! Ta da! The deep red color near the ceiling shows the interior color of the original kitchen cabinets. If you are wondering…the two openings at the top of the adjacent walls appears to have been a pantry back then in 1930. It also shows that the original kitchen did not have a soffit and was put in later. 1 comment on "KITCHEN CABINET REMOVAL"
Woohoo! Love kitchen demo! I'm always in favor of taking out a soffit and bringing cabinets up to the ceiling - it will help open up the space a ton!